(GRIN) There is a growing need for coordination of resources and people, and for the general population to find them both virtually and in their local communities. We receive many requests from parents, teachers, religious educators, and clinicians requesting help to understand and nurture children’s spiritual life. Using extensive contacts and today’s sophisticated information management technology, the GRIN would provide a database of coordinated resources and a contact listing or recommendations for everything from establishing local parenting groups to clinical services. As part of this we see a need to establish local parenting groups / salons for support and networking. We are seeking partnership to move this forward. Our lives are stories. Stories serve as portals to other worlds, provide heroes and hears, raise questions and activate imagination. 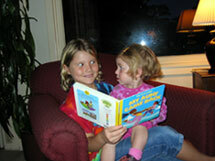 Children’s literature provides a rich and accessible way to enrich the developing life of young people. The Spirit in Children’s Literature project provides annotated bibliography of a wide and growing array of young people’s literature that addresses some aspect of the spiritual life, for example through inviting moral pondering or through moments of wonder. Ideas and exercises on how to use particular stories in various contexts are offered. The SCL project is interactive. Young people and adults are invited to offer book reviews, add exercises, artwork and other resources to help bring the literature of spirit and the spirit in literature alive. Ann M. Trousdale article Black and White Fire: The Interplay of Stories, Imagination, and Children’s Spirituality. Ann M. Trousdale’s Using Children’s Literature for Children’s Spiritual Development: Working Annotated Bibliography. Also, check out stories here.